You get a free 30 day trial of the Pro Plan. After 30 days, if you don't opt to continue the Pro Plan, your account automatically becomes a free forever plan. The Pro Plan is mostly about being ad free, using the DNA tools and private trees. Click here to compare the Pro Plan to the Free Forever Plan. Enter your first name and your last name. Enter a unique username. If you want a space in your username, you must insert a underscore "_" for the space. Enter a password. Re-enter your password on the next line. The "Next" button will now turn from gray to blue when all the fields are filled in. Click on the "Next" button. 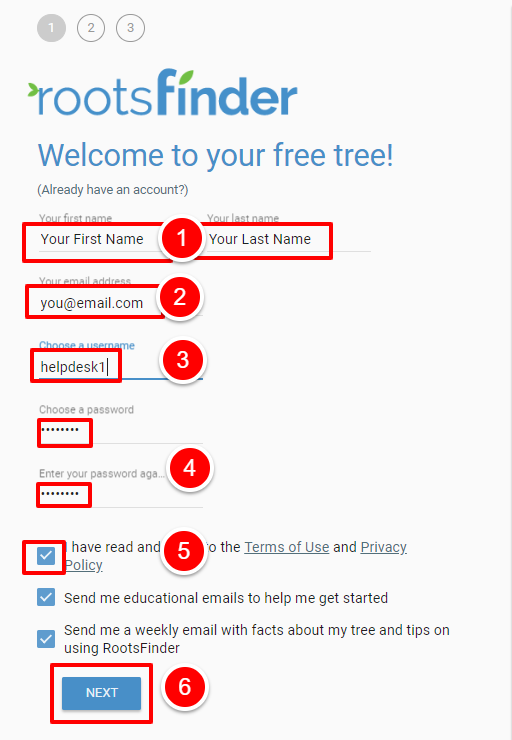 This will take you to page where you may start your first tree by entering the information, importing a GEDCOM or uploading your tree from FamilySearch. The Next button will not turn blue until everything is filled in.